I love Halloween. The idea of carving pumpkins and dressing up appeals a lot to me. 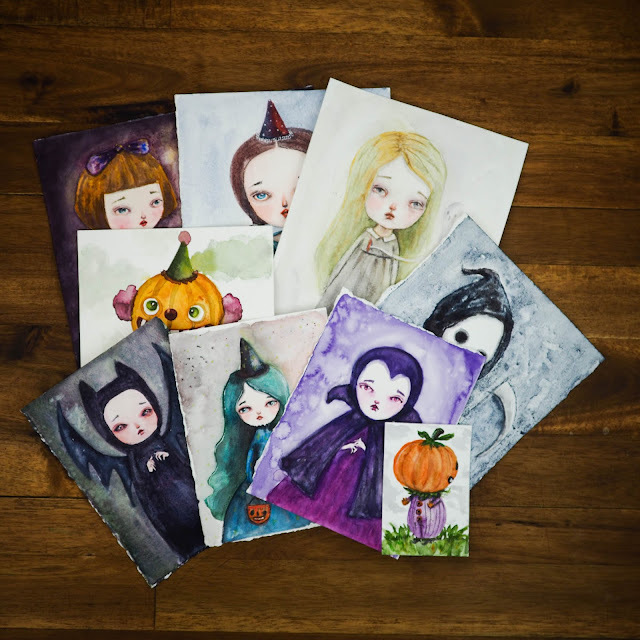 Creating special art with Halloween in mind is also very fun. So we celebrate Halloween as an adopted tradition and go trick or treating. Here's my daughter this year. 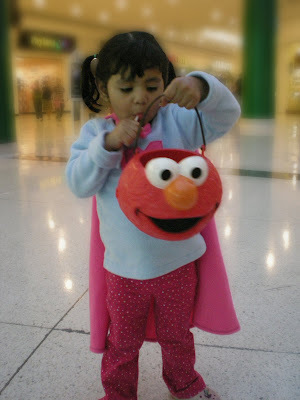 She went dressed as Super girl and got lots of candy... most of them which she ate that evening and then got a sugar rush. She never eats that much sugar... but we had a lot of fun! You just got to love these girls. 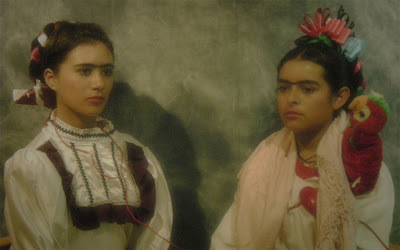 They were dressed as Fridas in one of her famous painting "Two Fridas". 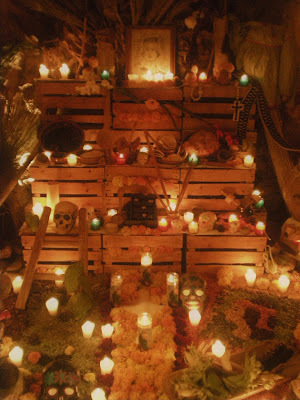 They were still the whole night, and their altar was very well decorated with lot of details. And there was also a show! Dances and a small play with this great Catrinas! They were like big puppets. 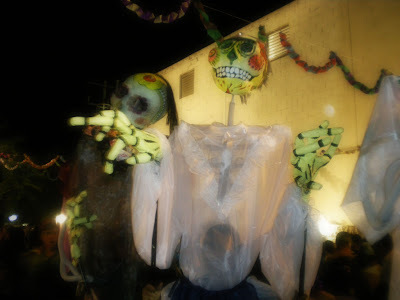 The play was about a day in the cementery in the Day of the Dead in which they didn't received any food. It was very funny! 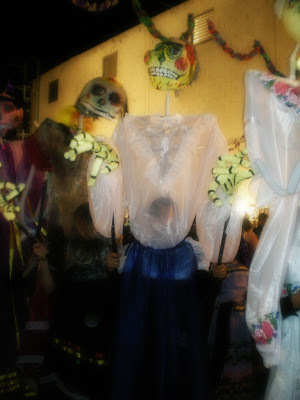 So this was the Day of the Dead for us. It was very fun, I hope you enjoyed the pictures. It's not like being there but it gives you a pretty idea of how great it was. ahhh!!! que miedo.. jeje. Me ha encantado el pequeño reportaje qeu has puesto de halloween. Y los muñequitos.. tan lindos como siempre! 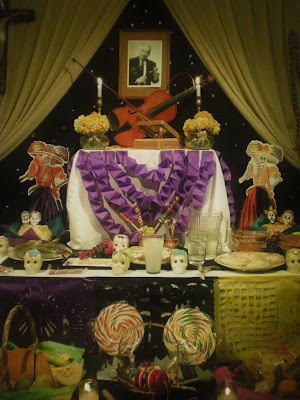 I would love to see the Altar celebration... it seems so rich, interesting, colorful! Wonderful, atmospheric photos ! 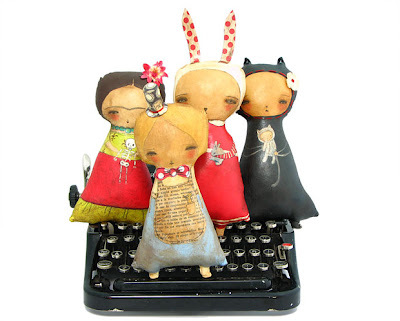 and those new dolls are adorable. 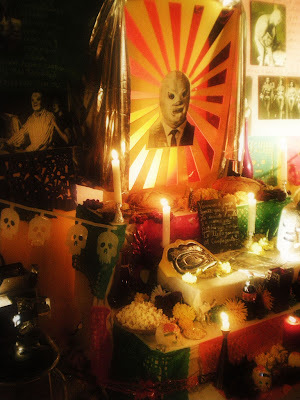 Thank you for posting and sharing the Altar photos. What a rare treat to see these. I agree--the Two Fridas were outstanding. 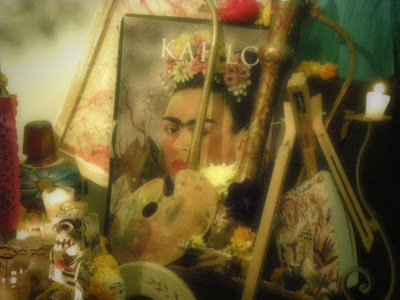 (I am a long time Frida fan.) But, all of the photos you showed are great and almost as good as being there. wow the alter celebration is something else...!!! 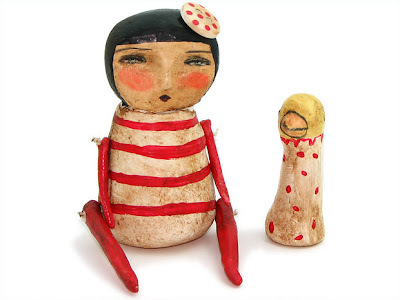 Your new dolls are great I love them. The market will open Nov 15th & run till Dec 31st. Let me know if you'd like to join us! Wow! 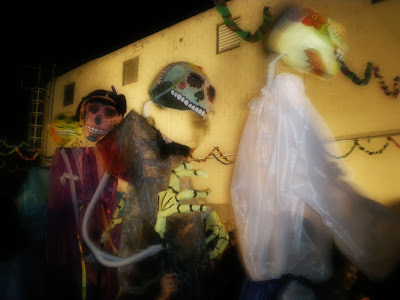 You are so fortunate to live where you can attend the festivities surrounding the Dia de los Muertos! The image of the two girls is very original and I love the idea that no matter how many alters you come across each is personalized and artistic in their own way. Wonderful images! fabulous pictures ,lovely the colorful alters and the girls were perfect! I lived in Las Cruces,NM for awhile as a girl and love the Mexican culture,music,food and strong family ties that I saw but was always welcomed by the families I met...anyways, always enjoy your work and blog! 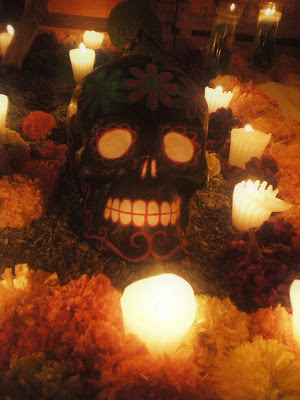 Where did you attend the Day of the Dead exhibit? I'm planning my Day of the Dead calendar for next year and want to see something fabulous like you saw. Please let me know where it was and any suggestions you may have. I'm glad you liked the pictures! I wanted to take more but it was so crowded we can barely walk. these are just adorable danita!!! i love em!